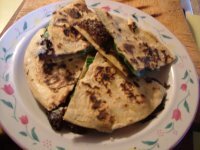 On Monday I had a thing about quesadillas. I had breakfast late and I took a couple of corn tortillas out of the freezer. I know, flour tortillas are supposed to be the thing for quesadillas, but I really love corn tortillas. I topped one with slices of my homemade Vegan "Gruyere" (but you could use any vegan "cheese") and fresh mango slices, topped it with another corn tortilla, and then pan-grilled it on both sides in a nonstick pan. I ate it with some storebought corn and tomato salsa...very satisfying. 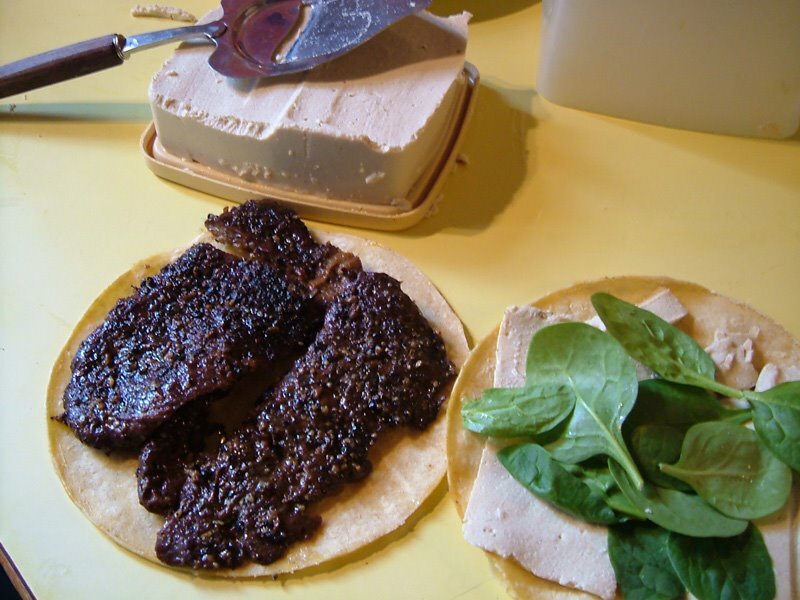 By the time I was hungry for lunch, I still craved tortillas, so I took a couple more out of the freezer, but this time I sliced one of my leftover Seitan "Steak" au Poivre in half horizontally and paired it with more of the Vegan "Gruyere" and some baby spinach leaves. I grilled it the same way. Because the "steak" was so peppery, I didn't need salsa with it. There you have it...nothing dramatic; quick, easy, tasty, healthful. 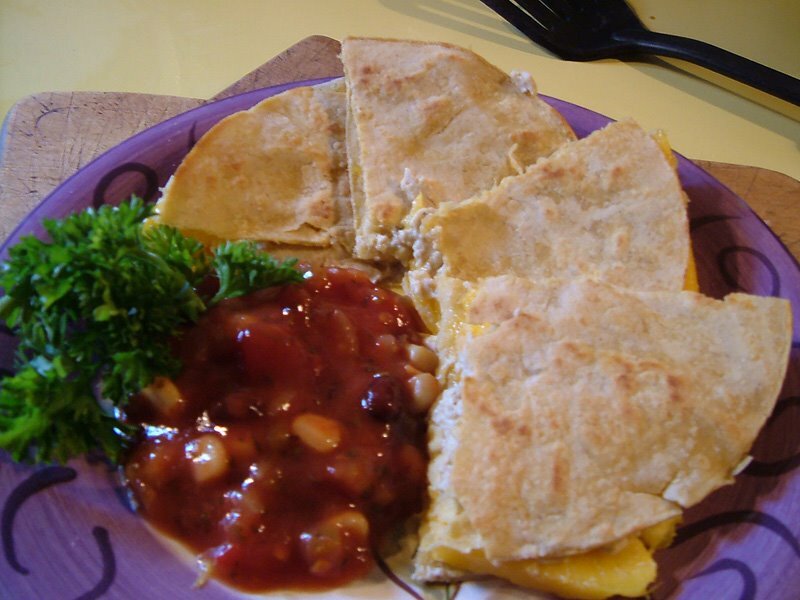 What do you like in quesadillas? Do you prefer corn or flour tortillas? 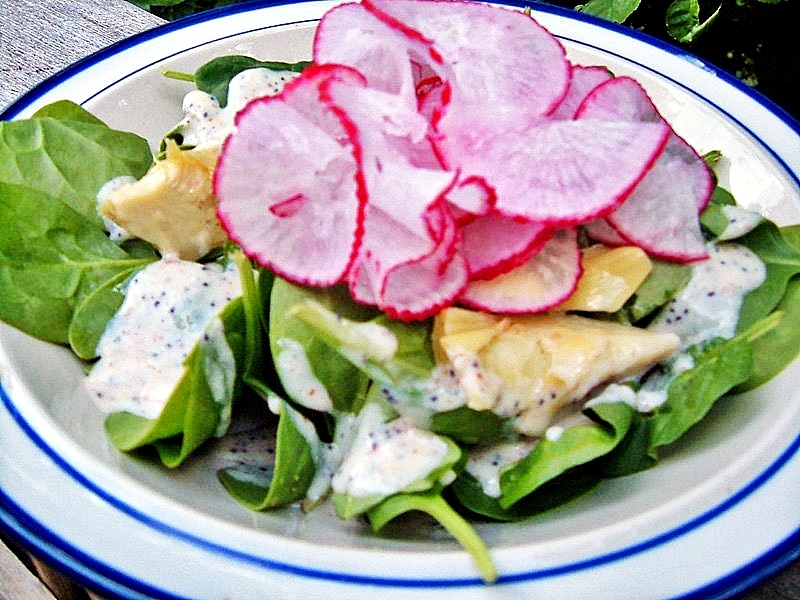 Tonight we had a spinach salad with my husband's favorite dressing, Poppy Seed. I'm going to share this easy, low-fat recipe with you-- it's very similar to the Poppy Seed Dressing that you can buy in bottles, or be served in restaurants, but those versions consist first and foremost of oil and either sugar in excess, or non-vegan honey. 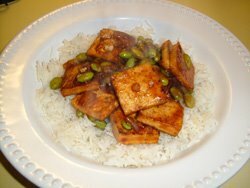 This version is quick and easy and very low in fat; sweet, but not cloying. It’s great on fruit salads, spinach salads, etc... We had it alongside Pommes Frites (French for French fries, but in this case they were oven-fries and also low-fat) and a new dish I tried for the next issue of the Vegan Feast newsletter [update: newsletter is now defunct], Vegan "Steak" au Poivre, made with homemade seitan "beefsteaks". 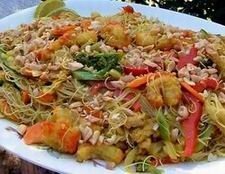 PS: ABOUT SPIRAL SLICERS: The Joyce Chen Saladacco Spiral Vegetable Slicer mentioned above gets mixed reviews online. It got consistently poor reviews on amazon, but pretty positive ones on cooking.com. I didn't buy mine, it was a gift, and I'm kind of glad I didn't pay the Cnd $30 for it. I like it, but it isn't very heavy-duty. I will just use it for decorative slicing, I think. But, here is a whole page (6 pages printed!) about using the Saladacco properly-- seems a bit much for something that is supposed to be simple. This is a Japanese one, the "Super Spiral Slicer", that is supposed to be a little better, and this one is very similar, but quite a bit cheaper (there are many similar models on the market). Options? This is a more expensive one, but it's bound be better than the Saladacco, because a.) it weighs quite a bit more, b.) because of the way you clamp the vegetables on it looks more stable, and c.) that you can just keep spiralling into a bowl and you don't have to empty the device out every few minutes. Oh, and it does thin strands, too. Store in a jar in the refrigerator. This recipe is easily multiplied. 1.) Use the white part of 2 or 3 green onions, or a shallot, instead of the onion. 2.) Use lemon juice instead of vinegar (you could also add a teaspoon of organic lemon zest, if you wish). 4.) Use 3 tablespoons maple syrup and 3 tablespoons frozen orange juice concentrate for the sweetener, and add a teaspoon of organic orange zest, if you wish. Nutrition (per 1/4 cup): 45.2 calories; 18% calories from fat; 1.0g total fat; 0.0mg cholesterol; 268.3mg sodium; 110.7mg potassium; 7.1g carbohydrates; 0.3g fiber; 0.6g sugar; 2.5g protein. 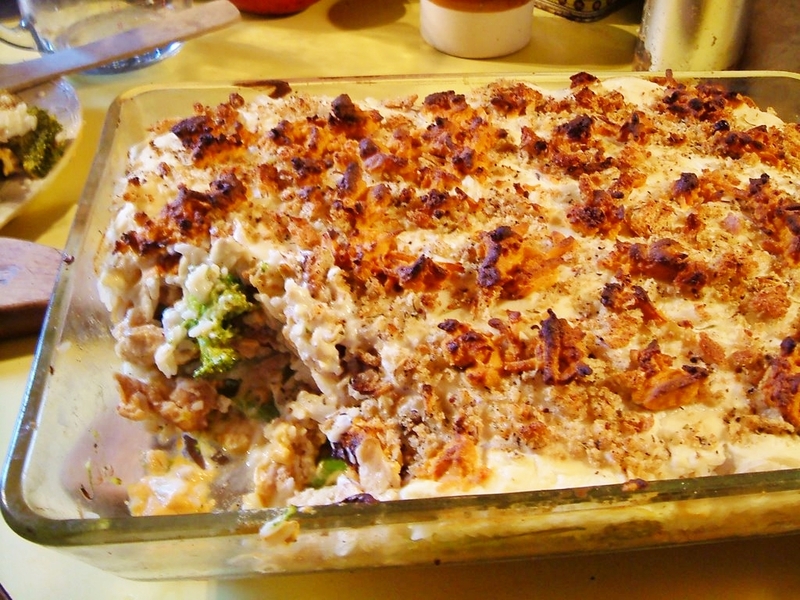 "Chicken Divan - A chicken casserole dish with broccoli and mornay or hollandaise sauce. 1950s - Chicken Divan was the signature dish of a 1950s New York restaurant, the Divan Parisienne. In English, the word "divan" came to mean sofa, from the council chamber's benches. In France it meant a meeting place or great hall. It was this meaning that attracted the notice of the owners of the New York restaurant as they searched for a name that would imply continental elegance." Now it seems very plain and homey to us, but that's kind of what I wanted. Current recipes call for cream of mushroom, broccoli or cheddar soup from a can for the sauce, but I used my vegan bechamel sauce mixed with the Tofu Sour creme instead (and here is a Bean-Based Vegan Bechamel Sauce). Most recipes also call for frozen broccoli, but I used fresh steamed. I also added lots of garlic to the Soy Curl "chicken" strips. Three of us ate 1/2 the large casserole (of course, one of us --not me!-- was pregnant and very hungry!). It's a little on the bland side, but that's kind of comforting sometimes. My husband liked it very much. 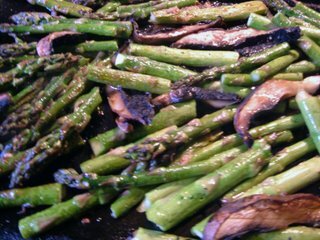 I also made a cookie sheet full of grilled asparagus and sliced portobella mushrooms with balsamic vinaigrette-- yum! 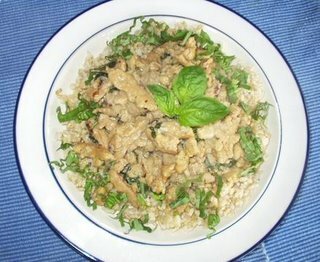 Saute the "chicken" sub in a large pan with the Earth balance and chopped garlic. Spread the steamed broccoli in the bottom of 1/ 9 x 13" baking pan . Cover that with the "chicken" sub. Sprinkle with salt and grind pepper over that to taste. 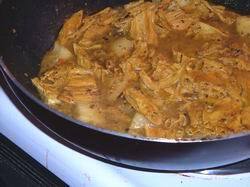 Spread 1 cup of the vegan "cheese" over the top (save the other half for the top of the finished casserole). Spread the cooked rice over that. Mix the bechamel sauce with the sour creme and lemon juice, stirring well. Drizzle this evenly over the casserole and smooth it out. Sprinkle evenly with the breadcrumbs and then spread, sprinkle or dot with the remaining "cheese". Nutrition Facts Nutrition (per serving): 302.1 calories; 37% calories from fat; 12.4g total fat; 0.0mg cholesterol; 599.3mg sodium; 463.2mg potassium; 34.8g carbohydrates; 3.5g fiber; 2.4g sugar; 31.3g net carbs; 14.1g protein. I spent my weekend cooking. 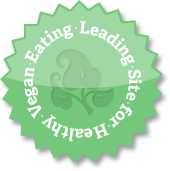 Three lovely, lively women from Vancouver, a mother and two daughters (one vegan), came to Denman Island and rented a beautiful house, where I taught two half-day classes in quick and easy vegan meals. 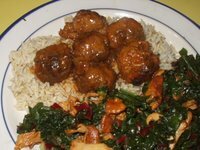 Saturday afternoon we made Asian-Fusion dishes for dinner, and this morning we made Mediterranean-style dishes for lunch. 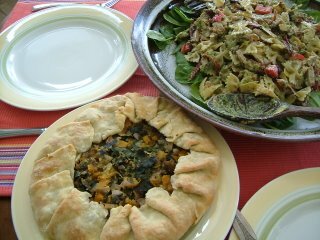 Most of the recipes were from past issues of the Vegan Feast newsletter, with a few from my books and one brand-new dessert. It was really fun, but, boy, do my feet hurt! And I still have to unpack some of the stuff I brought over there-- had to take half my kitchen with me! You never know what to expect, though. We had some trouble with the (pretty new) Jenn-Air stove, the burners of which would NOT get hot enough, so today I brought one of those little Chinese butane wok stoves and that really helped speed things up! They get really hot in a hurry. DO YOU USE YOUR SLOW-COOKER MUCH? I don't use mine nearly as often as I should. 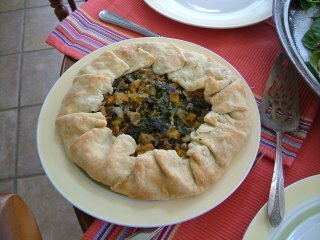 We often think of it as an appliance for winter meals-- stews, soups, beanpots, etc.. But it's great in the summer, too, because it doesn't give out much heat. I've baked pudding cakes in my slow-cooker, and they came out beautifully. 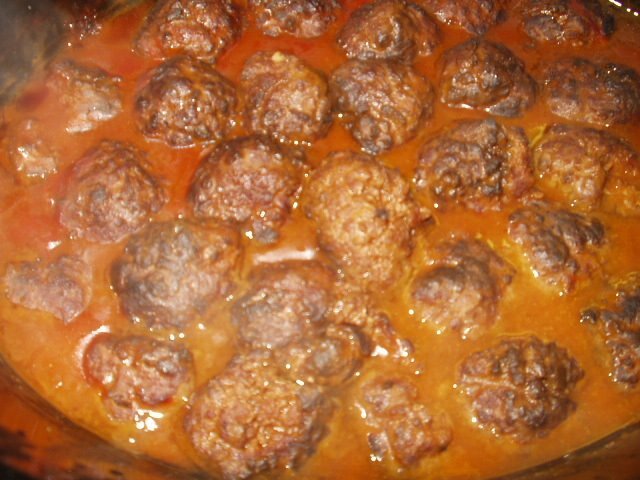 You can see from these pictures how the "neatballs" swell up in the sauce. 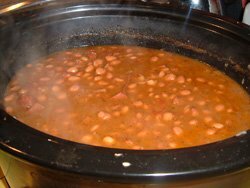 As for beans, it has been my experience, and many slow-cooker experts agree with me, that beans often don't cook properly in a slow cooker. 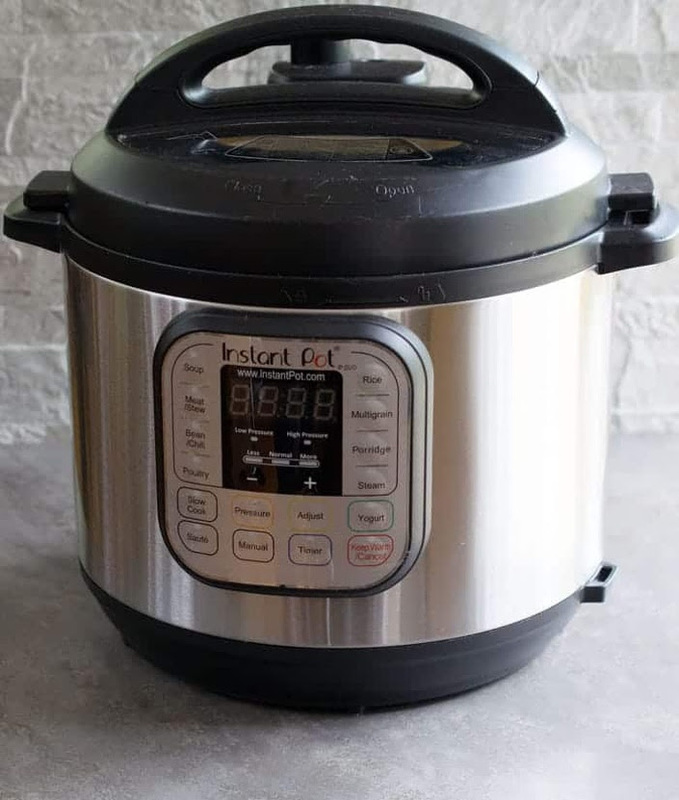 The cooking time depends on the type of slow-cooker, the variety of bean, the age and quality of the bean, the altitude, and whether you use hard or soft water. Consequently, many people used canned beans in slow-cooker bean recipes (you could freeze your own cooked beans). 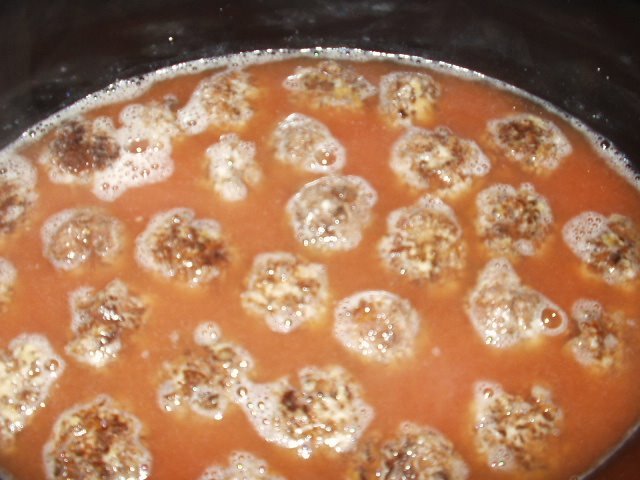 That said, to cook in a slow-cooker, they need to be soaked in lots of water overnight and drained, and then brought to a boil with plenty of fresh water and simmered rapidly for 10-15 minutes (and drained again) before placing in the slow-cooker with your other ingredients. Then they need to be cooked for 8-12 hours on Low, or for 5-6 hours on High. I use about 6 cups of liquid for 1 1/2 lbs. beans (which have bean soaked), though many books say 6 cups for 1 lb. I found that that left too much liquid.
" Drunken Beans" from the current issue of the Vegan Feast. Also, I have not found it to be true that you should not add salty, sweet, or acidic foods to the beans before they are completely cooked. I do that all the time! It might take a little longer, but the only reason I have found for beans absolutely not cooking is that they are very old. 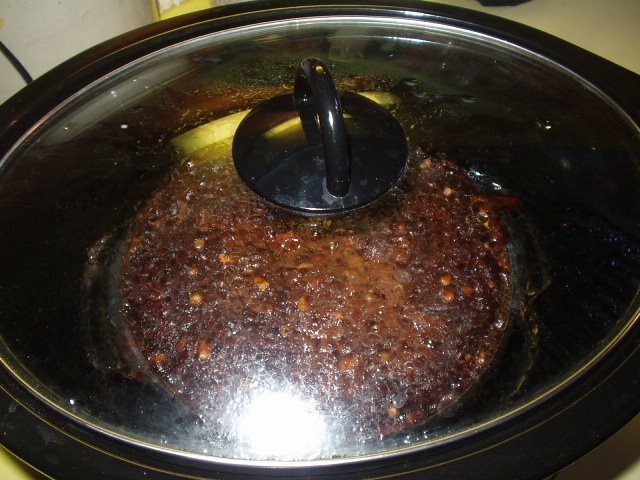 Some of you may already be aware of this, but you can make yummy vegan pudding cakes in your slow-cooker or Crockpot® (you know, the kind of cake that ends up with a sauce at the bottom of the pan). It cooks in 2 to 2 and 1/2 hours, and doesn’t heat the kitchen up (not a problem now, but come summer…). I baked mine in an glass casserole 7 1/2” across the top, 2 1/2” deep, and 6 1/2” across the bottom, which I placed in my 5-6 qt. oval cooker, but I understand that you can actually bake it right in the ceramic insert of a 3 1/2-4 qt. cooker. 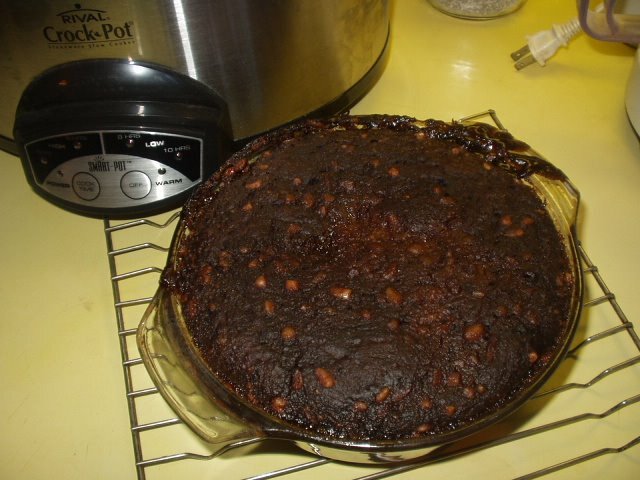 Either way, you can use your favourite pudding cake recipe that calls for about 1 c. flour in the batter. 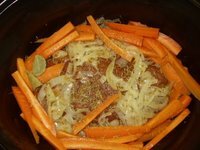 THE BASIC SLOW-COOKER BAKING METHOD: Proceed with your recipe as normal, in a pan as mentioned in the paragraph above, or in the insert (well-greased) of your 3 1/2 -4 qt. cooker. Cover the cooker and cook on high for 2 to 2 1/2 hours, or until a toothpick comes out clean when inserted into the cake. Let stand, uncovered, for 30-40 minutes. (Adapted from a recipe in my first book, "The Almost No Fat Cookbook”) 1.) Preheat the oven to 350 F. 4.) With wet fingers, spread the batter into a lightly greased or non-stick 8x8 inch pan. 6.) Sprinkle the sugar/cocoa mixture evenly over the top of the cake batter. Bake this for 35 minutes. (You might want to put a pizza pan or cookie sheet on the rack below the cake, just under it, to catch drips, if any.) OR use the Basic Slow-Cooker baking Method above. 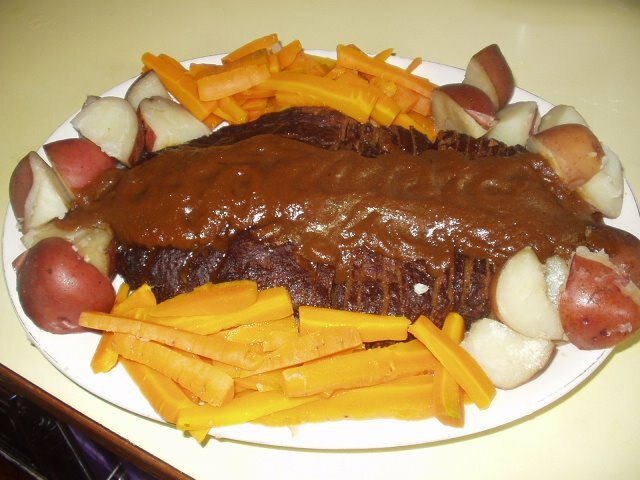 When it comes out of the oven (or slow-cooker), the cake will be on top with a sauce underneath. 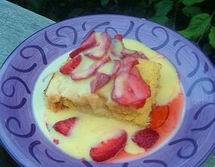 Serve plain or with vanilla nondairy frozen dessert. I'd love to hear about your vegan slow-cooker adventures! I should make stuffed crepes more often. I always forget how easy they are to make, and you can make them ahead of time and refrigerate or freeze them. They can be filled with almost anything sweet or savory. Perfect for company brunches, lunches and dinners, or for dessert. 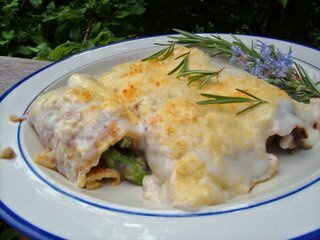 My mother came over for lunch today my DH suggested that I make one of her favorite dishes, asparagus crepes with a vegan bechamel sauce. I used my Tofu Crepes-- they are really a snap to make in the blender and you don't have to let the batter "rest". I never ruin any, like I usually do with crepes! The cooked crepes are light but sturdy and easy to handle, and have a very "eggy" feel to them. My mom loved it, and so did we! My DH is happy to have two crepes left to take for lunch tomorrow! 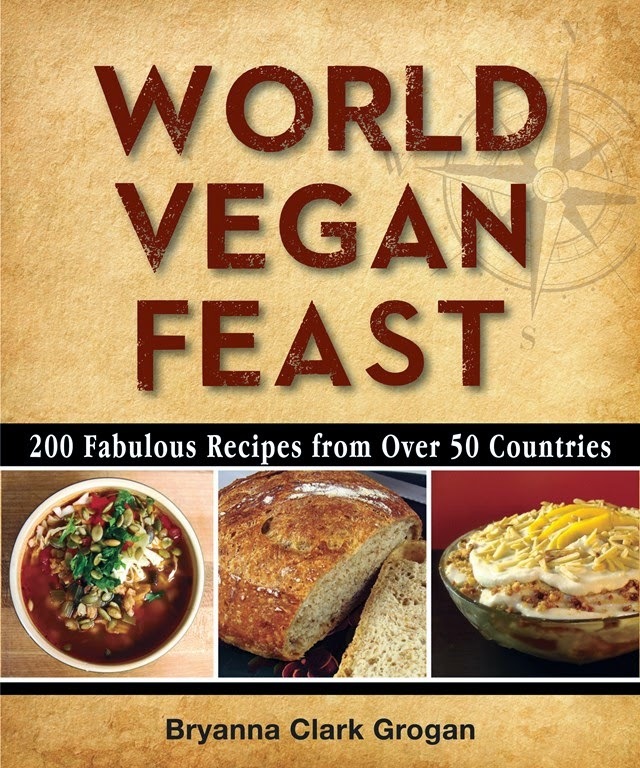 The recipe is in new book, World Vegan Feast . Happy Mothers' Day to all you moms, step-moms, grandmoms, foster moms, and moms-to-be! 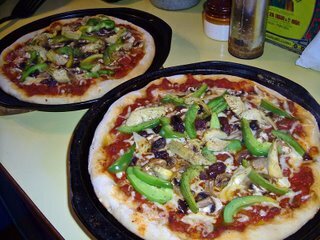 On the left are the pizzas I made for dinner last night, cooked in dark metal pizza pans on the oven racks, at 550 degrees F, with convection; on the right is a pizza made with the same dough, but baked on unglazed ceramic tiles in my oven, same temperature. I'm not going to go into a long explanation of how I make pizza. 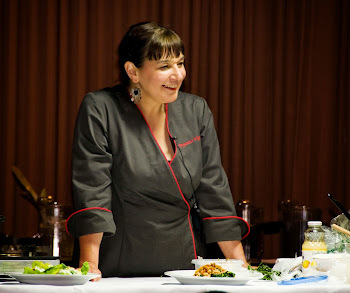 For that you can get my book Nonna's Italian Kitchen (your library might have it) or my new book World Vegan Feast for a newer version. There is so much bad pizza out there! Which is puzzling, because, once you know a few things, it's easy. And the dough is not an afterthought-- in Italy it is the primary component, and it should be here in N.A., too. In Italy they don't over load a pizza with sauce, ingredients, cheese, etc.. The dough is simple, very simple, but it tastes so good you want to eat the edges, and you don't need them to be stuffed with cheese or have some gloppy sauce to dip them into! I'm going to give you my latest favorite dough recipe, which is from my newsletter. 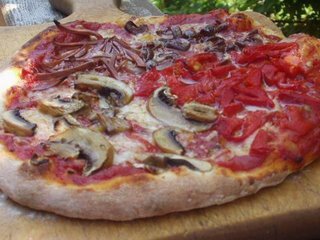 Both of the pizzas above were made with this dough. HINT: Pizza dough is better if you make it hours before using and let it rise in the refrigerator for 8-14 hours. Yes, it's true, and it's very convenient. The directions are in the recipe below. An alternative is to make it in the morning, let it rise once, punch it down and refrigerate as instructed until about 2 hours before dinner (so it has time to warm up). Why is it better this way? Because dough needs time to develop the enzymes which give dough flavor and good texture. BTW, "American Pie" by master baker Peter Reinhart is a wonderful book on pizza! A way to stretch the dough without rolling or throwing in the air! 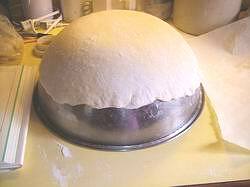 Drape the dough over an over-turned bowl (see picture) and gently stretch it all around until it is the right size, again using the weight of the dough stretch it. Work slowly so that you don’t tear the dough. If it does tear, you can patch it and seal it again. The pizza does not have to be absolutely round! 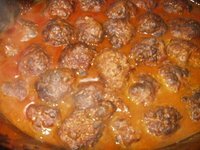 Not really a recipe-- just a guide! 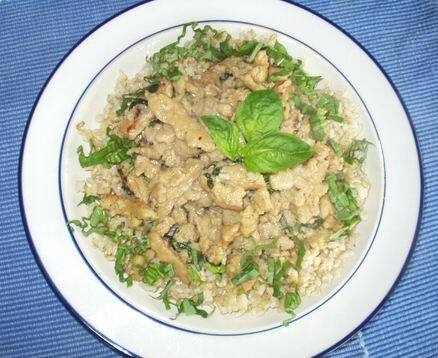 The original of this recipe is from Susan V's wonderful blog, Fatfree Vegan Kitchen. I've been wanting to try it since it was posted, but had to go shopping first. Susan used fingerling potatoes, but I couldn't find any, so I used those little baby nugget potatoes, the yellow ones. I changed the recipe a somewhat, mostly in the cooking method. I used 1 lb. 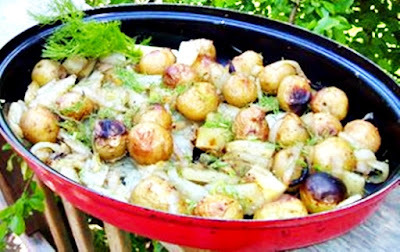 of nugget potatoes and 1 large fennel root, which I cut into chunks. I had half a large onion in the fridge, so I diced that up. I mixed everything in a shallow pan with the 1 cup broth Susan called for, and I roasted it in a 500 degree F oven for about 20 minutes, instead of braising it like Susan did. The broth cooked off and everything was starting to brown. I stirred it up gently, sprinkled it with some coarse salt that my daughter brought me from Mexico, and some freshly-ground pepper, and put the pan under the broiler for a few minutes, just to get a bit of a charred thing going-- not too much. It was delicious, and totally fat-free! I ate half of it all by myself for lunch! Thanks, Susan! After vegan cappuccinos, I'll continue the breakfast theme with waffles. This recipe is a variation on a recipe from one of my books. I love the combination of orange, pecan and cornmeal-- seems very Southern to me, and it's always delicious. 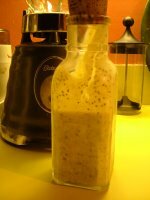 I decided to use this flavor combo in my bean-based waffles, which I usually make with oats. 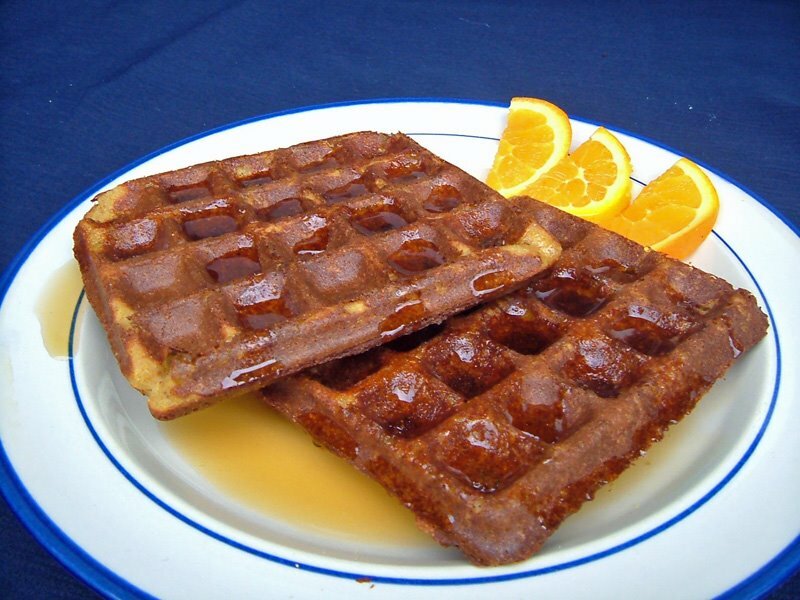 These waffles are high in protein and fiber and great for anyone with allergies. Hope you like 'em! PS: These bean waffles do not work for me in a Belgian waffle iron (the thicker kind), so use a good nonstick traditional type. 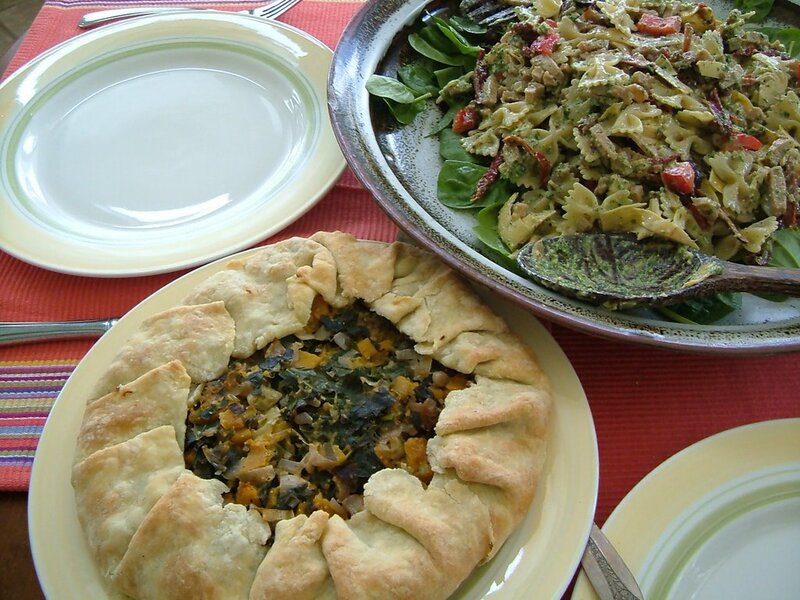 A good one is the round Cuisinart Traditional . Other waffles irons recommended by Cooks Illustrated are: Chef’s Choice WafflePro Express ; Cloer Double Waffle Maker ; Cuisinart 6-Slice Traditional Waffle Iron . Don’t be put off by having to put the beans on to soak the night before. This takes just minutes before you retire for the night and then, in the morning, the batter is quickly made in the blender while the waffle iron heats up. These waffles take a little longer to bake than ordinary waffles (about 7-8 minutes), so you might want to make them ahead of time, or have two waffle irons going at the same time. They can be reheated quickly in a very hot oven for a short time (you just want to crisp and heat them, not dry them out), or in a toaster.NOTE: And, don’t worry, no one will suspect that there are beans in these waffles! Soak the beans in plenty of water to cover, with a few inches of water above the beans-. The beans can soak in water in the refrigerator for up to a week with no fermentation, if you aren’t sure when you’ll make the waffles. Drain the beans. Place them in the blender along with all of the other ingredients. Blend until smooth and light and foamy. This may take several minutes. Let the batter stand while you heat up your NONSTICK waffle iron. NOTE: USE A REGULAR WAFFLE MAKER, NOT A BELGIAN WAFFLE MAKER-- THE BELGIAN WAFFLE IS TOO THICK AND DOESN'T COOK PROPERLY WITH THIS BATTER! See recommended waffle irons above.). 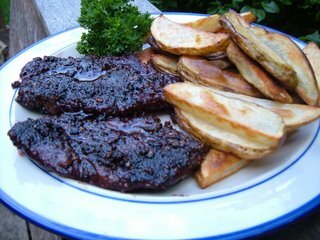 NOTE: Even if you have a non-stick iron, this recipe will work better if you spray the grids with oil from a pump-sprayer . When the iron is hot, pour on about a heaping 1/3 c. of batter for each 4” square waffle . Close the iron and set the timer for 7 minutes. Don’t check before 7 minutes is up. If the iron is hard to open, let it cook a couple of more minutes. If the batter gets thicker on standing, add a LITTLE water, just until it’s the consistency you started out with. The waffle should be brown and crispy. Serve immediately, or let cool on cake racks. When they are cool, they can be frozen in plastic bags or rigid containers. Serve with your favorite toppings. If you don’t use up all of the batter, and you don’t want to cook the waffles ahead of time and freeze them, just refrigerate the batter in the blender with the lid on. You can re-blend the batter (adding a tiny bit more water if the batter has become too thick) just before cooking the waffles. 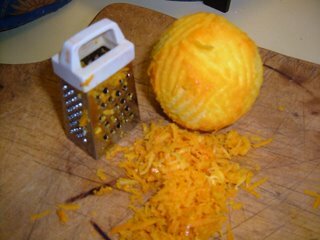 COOKING NOTE: If you don't have one of those microplane zesters yet, for citrus zest (and fresh ginger) use a little tiny box grater about 2 1/2" high. it works just beautifully and cost about $1.50 Cnd! Nutrition (per serving—2/ 4” waffles): 324.6 calories; 25% calories from fat; 10.0g total fat; 0.0mg cholesterol; 529.6mg sodium; 833.3mg potassium; 53.3g carbohydrates; 8.1g fiber; 14.1g sugar; 45.2g net carbs; 9.5g protein; 6.5 points.